Not all healthcare takes place in clinical settings like doctor’s offices, hospitals or health centers. When a community member needs care as fast as possible, Emergency Medical Services (EMS) providers are the first to respond, providing critical care at the scene, in the back of an ambulance, or even aboard a rescue boat, helicopter or other emergency vehicle. Because of their role on the “front line” of healthcare, EMS operations require a great deal of planning to ensure consistency, quality, and seamless cooperation with local hospitals, 911 centers and other agencies. In the North Country, FDRHPO assists with this planning and facilitation through its partnership with the North Country EMS Program Agency. 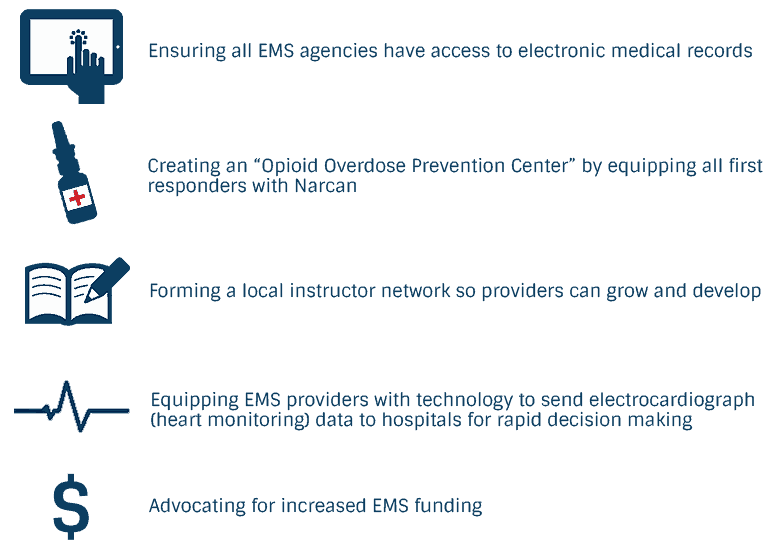 Through the guidance of the Regional Emergency Medical Services Council (REMSCO) and the Regional Emergency Medical Advisory Committee (REMAC), the Program Agency also works with educational institutions, 911 centers, hospital emergency departments, law enforcement officials, and other stakeholders to ensure the entire EMS system runs smoothly. These two regulatory bodies are composed of regional experts who meet quarterly to discuss current policies and procedures. To learn more about REMSCO and REMAC, click here. In addition to all this, the North Country EMS Program Agency hosts an educational EMS Conference in the region, which celebrates its 20th Anniversary in April 2019. This “Spring Fling” event is attended by hundreds of EMS providers from the tri-county area and beyond, and it provides valuable training and continuing medical education. If you have questions about the North Country EMS Program Agency, its initiatives, or something else EMS-related, we’re here to help! Get to know us below to see who might be your best contact. If you are a member of the media, please click here to reach our Communications Coordinator.